Danielle Conway became Dean of the University of Maine School of Law in July 2015. 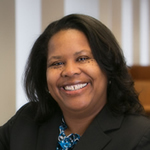 Dean Conway has earned a reputation as a leading expert in public procurement law, entrepreneurship, and as an advocate for minorities and Indigenous Peoples. She teaches in the areas of Intellectual Property Law, Licensing Intellectual Property, International Intellectual Property Law, Internet Law & Policy, and Government Contract Law. Dean Conway also has more than 20 years of active and reserve duty service with the U.S. Army, and currently serves as a Lieutenant Colonel.